Texture atlas is a collection of images, all composed in single large image. The game or HTML5 app can load this single image instead of wasting time for requesting every small image separately. I wrote tool that can be used to package collection of images to single atlas and let web app use that conveniently both as CSS sprite or in HTML5 canvas drawing. Install ImageMagick easily on OS/X with Macports or Homebrew. Defines padding. The amount of empty pixels around each image. This prevents scaling artifacts on HTML canvas use when drawing from decimal source coordinates. Maximum width and height of output image. Output JS import, JSON and CSS file. We have following small images that are needed in our web app. Loading them all independently would take 5 HTTP requests. In this example we defined maximum width of 512 pixels. The resulting image is cropped to minimum size 496×118. This atlas can be used now in two different ways on the web page. Web page includes the generated CSS file and defines class by filename (e.g. “bg-sprites status_bar” for each element that uses sprite. Another option is to use it with HTML canvas. Page links the generated JSON import script and loads the image. Get complete example from Github. There is often need to serve local files through web server so you can access them with browser at http://localhost:8000/ for development and debugging. Python has good tool, SimpleHTTPServer that can run standalone simply by command python -m SimpleHTTPServer in the directory you want to serve. Node.js has something similar, http-server that works essentially in the same way. That said, Today I thought that what internet needs is yet another example of http server with Node.js. Instead of the tools above I tend to use my own one-file implementation as it’s easy to expand and modify for testing purposes, for example to add some mock up Ajax endpoints. The code also demonstrates some common node.js programming patterns so learning programmers might find it useful. Server is based on express framework and uses send and async modules to serve index.html and directory listings. Minimum viable static file server is only few lines in express. In case file is not found, we need fallback handler for checking the index.html or if that does not exists then build directory listing. Note that this listens only HTTP GET requests, not POST or HEADs. There is to default 404 handler, as express does this automatically. Function that builds the HTML page from directory listing is surprisingly messy, as it’s not easy to do directory iteration with asynchronous node.js fs api. Directory listing use same HTML layout as python’s SimpleHTTPServer. Function uses async librarys queue to control the execution flow. Running directly with node. Server accepts web root directory as argument. Download and see full code in Github. Server prints out request access log for debugging purposes. 127.0.0.1 - - [Sun, 2 Apr 2013 12:48:08 GMT] "GET / HTTP/1.1" 200 730 "-" "Mozilla/5.0 (Macintosh; Intel Mac OS X 10.8; rv:20.0) Gecko/20100101 Firefox/20.0"
Here is a test server that you can use to verify your integration to Apple Push notification service and push notification feedback server. It should be good enough for testing out your application behavior and pdu format. Server helps you to get more debug info than just connecting directly to apple. Note that you may need to install binary module to run the server. Use npm install binary. Successful push notification sending should look like following. The server dumps the data from your app in binary format for debugging and tries to parse it as Push PDU. Server prints out the fields so you can verify the data. 00000000: 0100 0000 0151 7261 1d00 206b 4628 de93  .....Qra...kF(^. Test server does not validate the data, but it tries to parse JSON message in push notifications and prints error if it fails. Also if command was not set to 1, it sends back error pdu and closes connection. This should be good enough for testing. For example here I made HTTP request to the server to get some error output. 00000000: 4745 5420 2f20 4854 5450 2f31 2e31 0d0a  GET./.HTTP/1.1.. When your app connects successfully to the feedback test service, it sends back few feedback tokens and closes connection after one minute. Edit the actual tokens in the server source code. Source code is available in Github. This is continuation to my previous blog post, that discussed how to make simple Slots machine with HTML5. The basic principle in this driving game demo is similar, but in addition to that it adds dynamic graphics using canvas. Game road is div with background image that is translated down and back up to create illusion of moving road. This same method is used in Slots machine. Cars are drawn on canvas on top of the road so while road moves cars appear moving forward. Each click starts moving the player car from current point to the click point using smooth Bezier curve. Car acceleration is increased or decreased depending on click location. Player car also has smoke plume animation which intensity depends on acceleration. After car has travelled long enough, the update loop starts slowing down road speed and moves in sync div that holds Finish text and flags. Collision detection is done on each update. In case player hits on other cars, the other cars may blurb random bubbles that are added as normal div elements with rounded borders. Element location is updated based on car location. In collision both cars are bumped so player can make room by hitting to other cars. Game loop is run by animation frames, so it stops if browser window goes in background. This is not optimal but makes implementation simpler. Better option is to run update with setInterval and draw on animation frames. Update and draw in separate loops. This is better solution for complex games because browser will always call setInterval callback but requestAnimFrame callback only if browser window is visible and active. Callback is not executed if browser window is minimized or it’s tab is on background. If you rely only on requestAnimFrame the game is paused on background. Game code is available in GitHub. UPDATE: See also Simple Slot machine game using HTML5 Part 2: Audio. 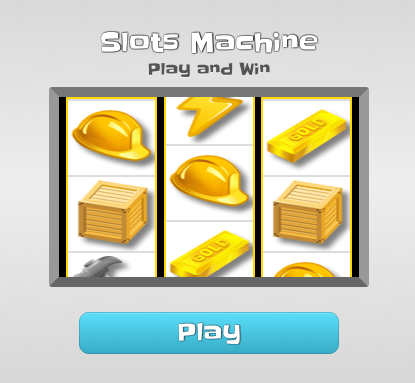 Here is overview on how to make simple Slot machine with HTML5. 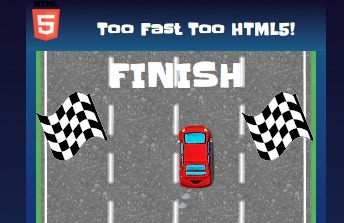 This demonstrates the basic structure of HTML5 game and how to use dynamically created graphics. Slot machine has typically reels with images and player just initiates the action and waits until reels stop. 1 or more in single line usually determine the winning condition. In this game player wins if he or she gets more than one gold bar in row. Here is view of the game. You can try it out here http://ikonen.me/examples/slot/. Slot machine is a single HTML page that includes the game code, webfont and jQuery. When loaded it runs SlotGame() function that initializes and runs the game. HTML page has 3 narrow and tall HTML5 canvases, these are the reels. They are located inside div container “reels” that shows only a limited window at any time, hiding the rest of the canvases. On initialization, game preloads the 6 image assets. Preloading is simply done by creating Image object for each asset and listening its load event. Preloading is required, because otherwise game could not draw the reel canvases on initialization. Game draws the pictures in random order on each canvas reel with shadow and slot separator bars. The reels are not redrawn after this, but when moving they are simply translated with CSS3 transform downwards and when they reach threshold they are moved back to beginning. Threshold and reset offset is selected so that after the reset images are shown on same locations. This creates illusion of constantly rotating wheel. This is why images on borders are twice in the reel, so we avoid showing canvas bottom or top in any situation. Here is image where reel container overflow is set to visible. Game loop is simple, it starts when player clicks ‘Play’ and runs on every animation frame updating the reel locations based on game state and “draws” them on screen, or actually as explained earlier just translates their locations. Result is predetermined on each roll start and when each reel stop, its locked on the correct image. Update loop tries to make this when correct image is close to this location, so the jump is not too abrupt (see function _check_slot in slot.js for details). Each browser has still different name for the transform so initialization code determines the correct CSS name and if browser has hardware accelerated 3d version. Complete code is available on Github. Apple assumes that your app polls the Push Notification Feedback Service to get information about App uninstalls so you can stop sending notifications to those devices. Service returns list of tokens with uninstall timestamps. This is how you can do it with Node.js. First, check TLS Example and how to create SSL certs to understand basics of how to make secure SSL connection with Node.js. Then polling function that does it all, note that it assumes function connectAPN that needs simply create SSL connection to ‘feedback.push.apple.com’ port 2196 with your apps client cert and private key. The function read raw binary data from connection and after Feedback services closes the socket (this happens immediately after it has sent the data) it parses tokens and calls processing function to handle them. Function connects to server every 4 hours. Note that feedback service host and port is different for sandbox (testing environment) that also needs its own SSL certificates.